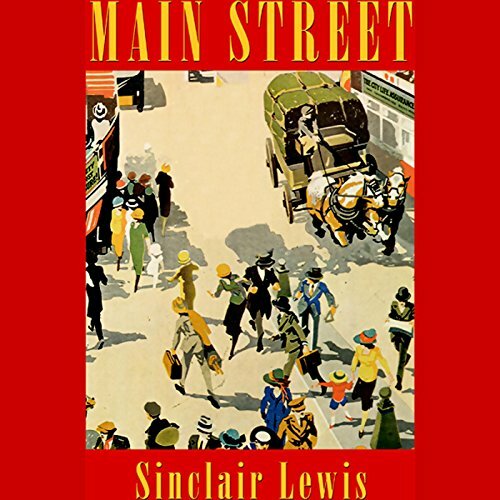 Published in 1920, Main Street was Sinclair Lewis' first really successful novel. An allegory of exile and return, Main Street attacks the complacency and ingrown mores of those who resist change, who are under the illusion that they have chosen their tradition. Maxwell Geismar lauded this work as "a remarkable diary of the middle-class mind in America". It's hard to believe that this book was first published in 1920. Many of the themes are as relevant today as they were 90 years ago. The narrator is excellent and doesn't get "in the way" of the story line. This classic is definitely worth rediscovering. Book: In general, I do not comment on classics. However, I found the story interesting since it draws from the history in the US from 100 years ago: Pre-WWI, midwest, industrialization of the economy, the movement of most of the population from the farm to the city, etc - all the changes - economic, political, social, etc. The character, a college girl with a liberal outlook, for some strange reason decides to marry a small town doctor. The book dwells, to the point of depression, on the failings of the small town. It was a counter to all the books of the time that over-glorified small town life. Mr. Lewis challenge all those notions. However, I did not really feel too much empathy for his lead character. Performance: The reader was very good. In time, I forgot there was reader and toward the end of the book the reader acted some of the characters well out. I really enjoyed this book, I found the issues and personalities to be surprisingly familiar, considering that it was published in 1920. Also, that a man of that time could write such a feminist novel. Although not much happens action-wise, I felt engaged throughout. Wonderfully real characters and an incredible sensitivity to their various motivations. File began with normal Audible introduction but followed by chapter 14. Could not determine proper order as chapter titled sections do not correspond to the material in each. As a life-long resident of small towns (2,000-7,000 population), I found this a troublesome and fascinatingly critical story of the "paused in time and context" of small town culture. Brian Emerson does his best with the story, but he seems to have trouble differentiating the men in the story--all of them sound the same. My favorite character was...Gopher P. The strongest part of Main Street is how superbly Lewis describes small town life in such sensorial beauty. There were several different instances that I cannot list them all. He makes it sound like a lovely, timeless world unto itself. A interesting book that is worth looking at again, but quite critical of small town life as if it threatens the progress of civilization. It does just the opposite: small towns are the bastion of civilization in an uncivilized world in a major way. The performance was above average- I had to speed it up quite a bit, and I appreciated him trying to differentiate voices. I think this would have been a hard book to stay engaged with if the narrator didn’t participate so much with the voices and characters. I read this while trying to read and compare Hemingway, Fitzgerald, and Lewis’ writing styles. Considering they were all writing around the same time, I find Lewis’ writing style and commentary more realistic and poignant. Especially in “Main Street,” his prose continues to challenge the American ideals. There were specific parts, like with the red Swede, which were a remarkably accurate paradox between the 20s and today. The feeling of being a liberal or a reformer, but also being a part of a middle to high class lifestyle. Furthermore, Lewis’ novel superbly describes the balance and hardship of wanting to challenge the norm for betterment of society, while wanting to fit in. The novel challenges me to reconsider any charity or progressive ideal I may have and really think about the intention behind those ideals. Lewis seems to want to show that we are all kindred spirits and that the poor man needs the rich man just as much as the rich man needs the poor man. I will say, sometimes the descriptions and banter was a little over-done for me, especially at the beginning, but it also made sure to paint the full picture. If you power through the first ten or so chapters you will become entranced and very thoughtful about the underlying messages. At times, I also struggled with the innocence (sometimes crossing into ignorance) of Carol, as well as her complete disregard (and Lewis’) for the benefits of small towns. Nonetheless, I highly recommend! I wish I would have read this in high school or college too! This came recommended so I was looking forward to the listen, but finally have it up about one-third of the way through. I'm not sure if it was the uninspired narration or the story that went no where fast that caused me to give up. I felt bad about quitting, but within 5 minutes of my next book I was glad I did. Lewis was in DESPERATE need of a good editor with this one. While I enjoy long lyrical descriptions of setting and character, it must be done in context. There was some of that, but I felt most of the book was just spinning in the mud and going nowhere. I got the point that Carol didn't fit in Gopher Prairie very quickly but it was hashed out over and over again. I found her to be quite as obnoxious in her haughty opinions of the towns people as they were in their judgement of her. Given the time a place, I can imagine this was very controversial, and the last 4 hours does get a bit better but it was long and dull. Perhaps that was the point to try to catapult the reader into action at a time when there was a battle between moving forward and making progress and clinging to what had traditionally made us American and maintaining status quo. The book does a fantastic job of pitting the two points of view against each other but it takes so long to get to it that it was a monotonous journey. The narrator did a fine job esp with the different kinds of accents he was able to employ. Overall, not one I'd recommend. What did you love best about Main Street? The descriptions of Gopher Prarie, Minnesota, are as apt today as they were almost 100 years ago. Lewis alternately loves and loathes the town, where an outsider is anyone who wasn't born and raised in the town. The treatment and scorn of minorities by the town could be Arizona today, except that in Gopher Prairie, the hated immigrants taking the worst jobs and struggling to find a better future for their children are Swedish immigrants. Carol, the idealistic wife of one of the town doctors imported from the big city, finds solace in her friendships with her maids. The town disapproves, and she is shocked to find, talks about her behind her back. At the same time, the sins of her husband, are never revealed to her. The story was unexpectedly bleak, and I realized it couldn't have been written today. In the 1920's, women mostly didn't work outside of the home. There was no television, and if radio had come to Gopher Prarie, Lewis didn't mention it. The town spent its time watching its inhabitants, gossiping, and seeking a safe kind of education through traveling lectures. I was able to imagine what the lives of my Midwestern great grandparents were like. The pace of the story was slow, but it was written in a much different time. Which character – as performed by Brian Emerson – was your favorite? Mr. Emerson is an excellent narrator, and I will look for other performances. He tells the story without putting himself into it. Carol, who struggles against the status quo, is my favorite character.